The conference will be held October 7-10, 2019 in San Diego. Register NOW! 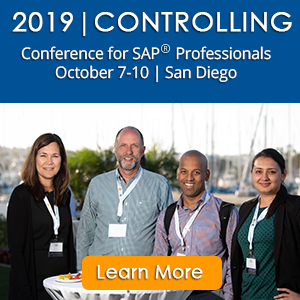 Don't miss this premier event for SAP Controlling professionals. Our expert SAP FI/CO consultants are available to work onsite to assist you in improving your SAP financial controlling system. Learn the pros and cons of the different options you have available within the setup of your particular SAP system. Conference for SAP® professionals covering detailed topics in the management accounting module of SAP. Learn firsthand from SAP® customers their experiences, lessons learned and advice for others. Think outside the box and gain insight into how to configure solutions for your company or industry by using SAP in a way you hadn't considered before.